Keeping a tidy, fresh-cut lawn is an important job for many homeowners throughout the year for practical and aesthetic reasons. 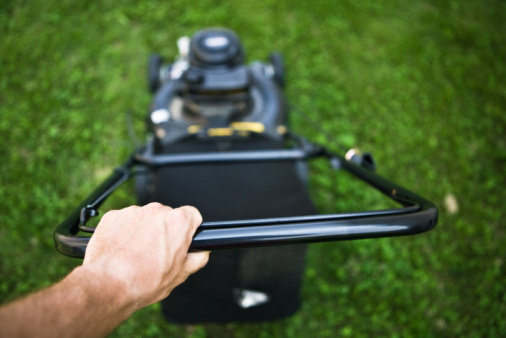 A neatly trimmed lawn not only makes a home look tidy, it's useful for sports or other activities during the summer. Troubleshooting your John Deere lawnmower when it doesn't start involves checking the fundamental components required to start the motor. Keep your lawnmower running well throughout the summer. Top up the tank with fuel. There may not be enough left in the tank to start the motor. Replace the fuel if it appears dirty or it has been standing for a few months. Moisture can find its way into the fuel tank and stop the engine from starting. Dirty fuel is harder to use and can damage the engine. Move the "Neutral Lock" lever to the "Lock" position and hold down the operator presence control lever on the handlebar while you pull the starter cord. John Deere lawnmowers won't start unless both these safety measures are met. Move the "Neutral Lock" back to "Unlock" once the motor is running. Check the spark plug. Put the rubber boot covering the end of the plug in place and start the mower again. Unscrew the spark plug and take it to your local hardware store for an exact replacement if the lawnmower won't start. Screw in the replacement. Replace the rubber boot and start the mower again. Remove the air filter from the side of the lawn mower and wash it in warm, soapy water. Debris and oil block the air filter and prevent the mower starting. The exact location of the filter will depend on your model of mower. It's usually accessed by unscrewing a panel on the side of the engine. Let the filter dry before replacing it.